The first time I've appreciated cinematography (i.e. 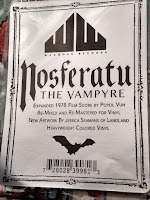 movies) as an art was when I watched an expert commentary for the 1922 Nosferatu on DVD. All the bits and images clicked in beautifully leaving me with a lasting impression and wanting for more. Fortunately, the entertainment industry has not disappointed in this respect and some Nosferatu's characteristics resurface from time to time. One of the most comprehensive is Kinski's 1970s remake which explored some possibilities. One of those is the addition of an inherent soundtrack by Popol Vuh. By itself that music is both atmospheric and evocative and can stand on its own. When I gave it a few listens on spotify I knew that this music had to sound amazing on vinyl. 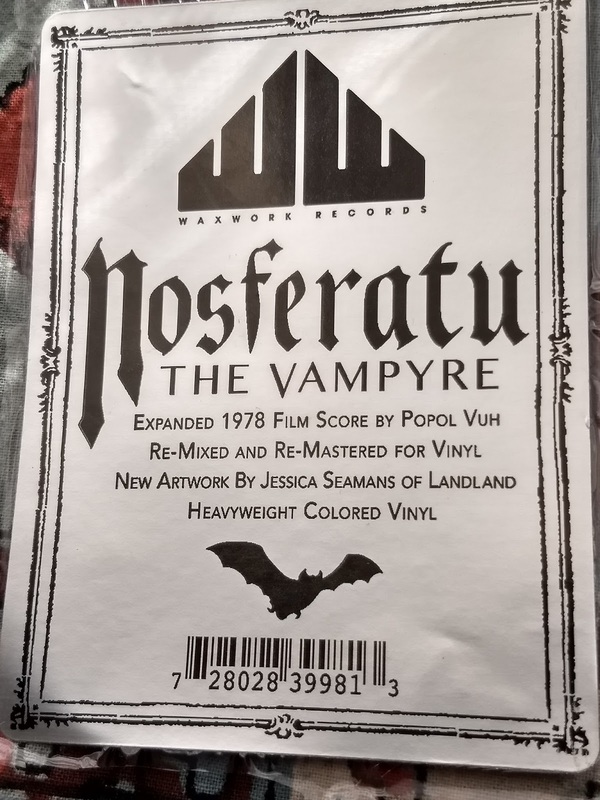 It was a fortunate circumstance that not only the music existed for the format but that a new release from Waxwork records was available. As with most of Waxwork's releases this one is pure eye candy. The new artwork is superb and presented in a gatefold fashion. There's an insert by the artist in which she explains her vision for the project. On the other side of this insert is the cover art in just a tad a smaller format than the cover. Presumably, and you can frame this instead of the whole album cover. 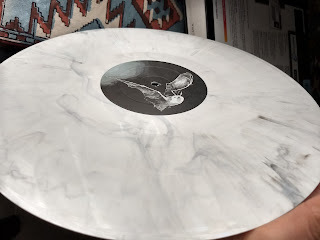 The variant I received was that white marbled one which is absolutely the most beautiful vinyl I have set my eyes on. Keep in mind that my whole experience up until very recently have been my father's LPs which are uniformly black and some solid-colored ones here and there. The two vinyls on which the music is divided really look like marble. The inner sleeves are of black paper which is also a first for me. I'm sure that you metalheads have been getting this kind of merchandise for years now, but it's really something when you experience it for the first time. The center labels are also black with the track listings on one side and bat illustrations on the other. There's a bit of torn label near the punch holes that while undeserving, don't distract much. The pressing themselves for each LP are another matter. For a brand-new record is noticeably noisy on the first two sides with various clicks and hiss. These are all of small magnitude and certainly are not worrisome but they make you wonder about quality assurance. Due to the nature of the subject matter the clicks might even add some "character" to the output, but one would have expected less of them in this day and age. The last two sides sounded uniformly fine. 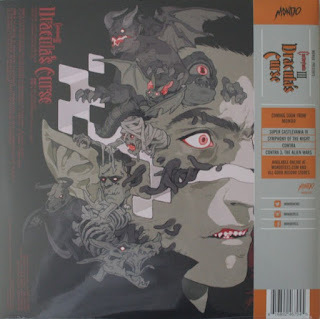 The only other drawback with this release is the difficulty of getting the inner sleeves into the outer as they do not seem to want to slide in easily and there is some risk of mangling that the thinner inner sleeve or damaging the insert. The album as a whole fits well in the the Groove Vinyl oversized plastic covers. At the time of this writing it is out of stock but if you can get hold of it, I think it will be a great addition to your collection even more if you are a soundtrack aficionado. I will still be looking forward to Waxwork's future releases and hope that they finally iron out the kinks in the pressing process.